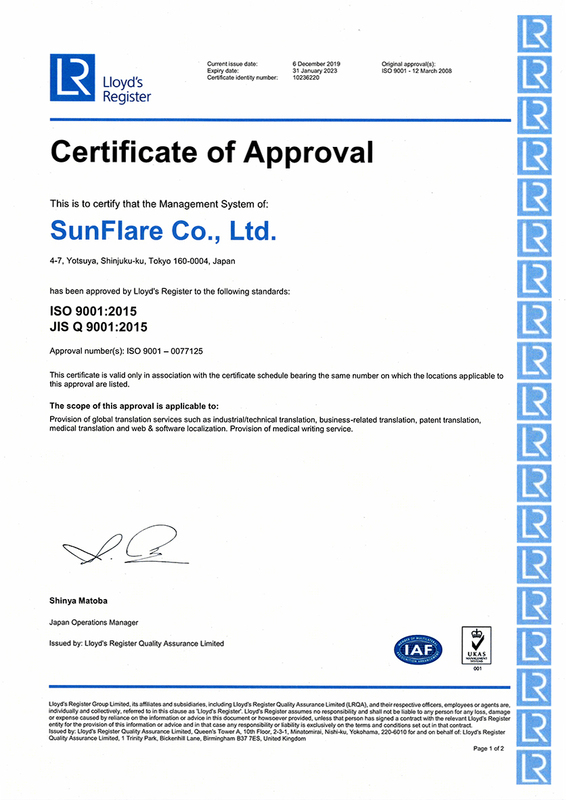 Translation - Services - SunFlare Co., Ltd. Taking into account our clients' needs, including the background and intended purpose of their translation projects, we deliver high-quality translation services that are optimized to bridge linguistic barriers in any business scenario. We have a network of approximately 6,000 translators with professional expertise in a variety of specialist fields. We select an appropriate translator for each translation project based on the translation category and document type. For more complex translation categories, we ensure peace of mind for the client by cross-checking the translation. Our engineers have developed tools that enable us to deliver high-quality translations efficiently and reliably. These tools allow us to complete translations expeditiously without sacrificing quality, thereby ensuring that we meet client needs in every project. Our engineers develop and customize the necessary tools according to the individual project. This improves the efficiency and quality of our translation work considerably. In accordance with the individual client's preferences, we create a glossary (database) of phrases and industry jargon that are commonly used in each project category. These databases are meticulously managed and updated to include client feedback, as well. 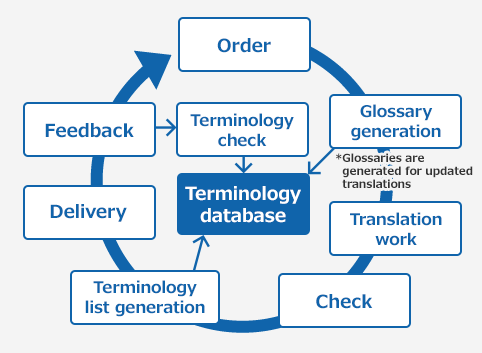 This limits the risk of inconsistencies in the use of terminology and improves the translation accuracy. In large-scale projects that call for a high degree of expertise, our translation editors and proofreaders use our proprietary tools to ensure that numbers and symbols are accurately used and that the spelling is correct. This helps to eliminate mistakes that may otherwise go unnoticed. 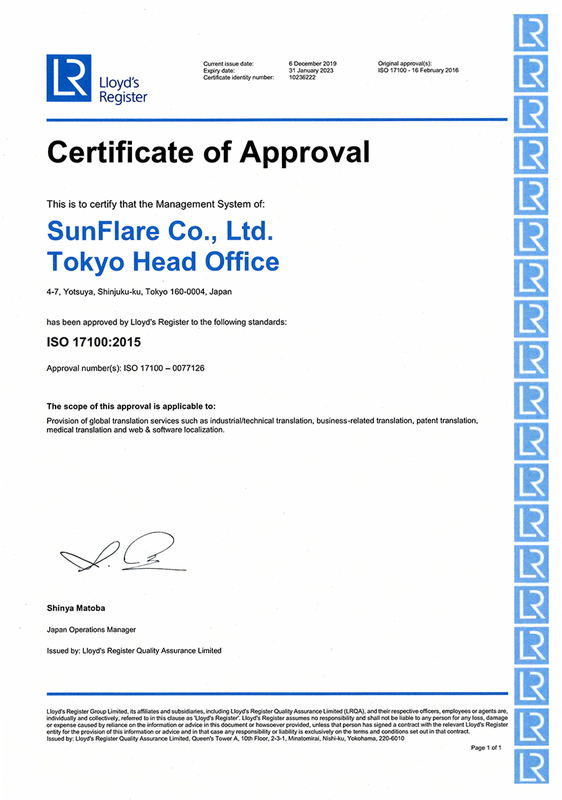 Ever since SunFlare's establishment, many of our registered translators have graduated from SunFlare Academy, a translation school that prioritizes translation quality. We provide regular training and client feedback to our translators, proofreaders, checkers, and every other member of our translation team, because consistently improving quality is one of our core goals. SunFlare Academy caters to a variety of different lifestyles by allowing students to either attend lessons in person or learn via a correspondence course. Since our lessons feature practical content that can be applied in actual translation work for SunFlare, our students acquire a well-rounded knowledge base in a wide range of industry and business categories. Students who pass our Translator Qualifying Examination (TQE) are also entitled to register with SunFlare. To date, over 3,000 translators have registered with us through this system. 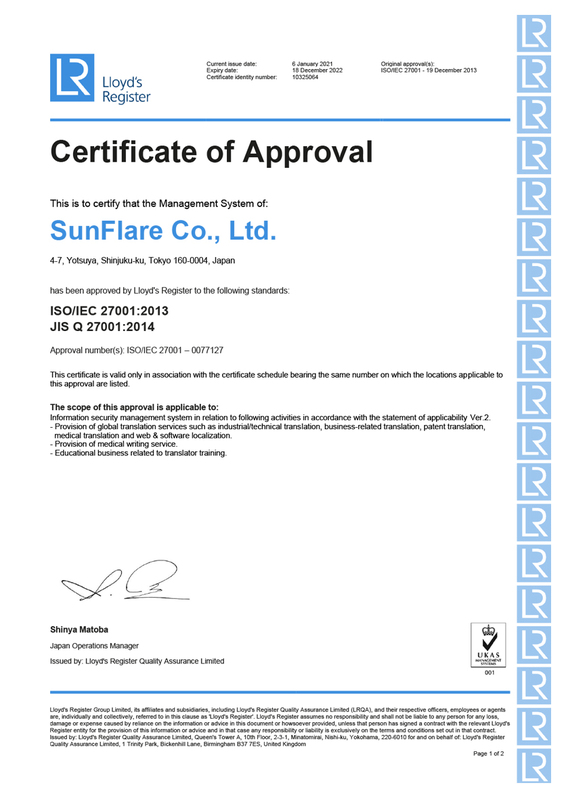 SunFlare constructs translation systems that cater to the individual client's needs. Prior to every translation project, we meet with the client to clarify the project specifications and then select the optimal translator for the particular category. After the translation has been edited and proofread, the documents are generated using the client's choice of application. In this way, we are able to deliver documents that meet the individual client's needs, allowing them to be used immediately without further alteration. *Where necessary, we consult with experts in each stage of the process and create specifications, glossaries, and reference materials that reflect the client's requirements to ensure an optimal workflow. *Following receipt of the client's request, we optimize our staff selection and workflow based on past client feedback, information on similar projects, and production information. *We can ensure consistency for a wide range of terminology and expressions, even if CAT tools are not used for the project. *We treat all client feedback as a valuable resource and make effective use of it by utilizing a PDCA cycle to pursue further quality improvements.